When I was in middle school, I had the opportunity to visit Space Camp in Huntsville, Alabama. The first thing I did when I got there was ask where the zero gravity room was. Unfortunately, it turned out that such a room didn't exist, but I learned that astronauts do train in zero gravity aboard parabolic flights. Ever since I have wanted to get on one of those flights to experience the freedom of floating in microgravity and better appreciate what it takes to train as an astronaut. Now that dream has come true. 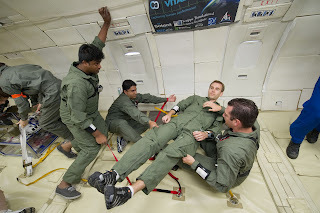 There are two ways one can get on a parabolic flight. If you have a few thousand dollars to burn, you can purchase a flight as a tourist with the Zero Gravity Corporation for 15 parabolas - or about 6 minutes - of reduced gravity fun. I was tantalizing close to making that happen in 2010, but it just didn't work out. The other way to fly in microgravity is to get involved with a research or education program requiring parabolic flight. If you are a K-12 teacher, you have ample opportunities from both NASA and the private sector. However, since I am not a teacher, that leaves research as the only practical option available. It took a lot of work, but I finally made it happen through Astronauts4Hire (A4H) in a recent parabolic flight campaign facilitated by NASA. 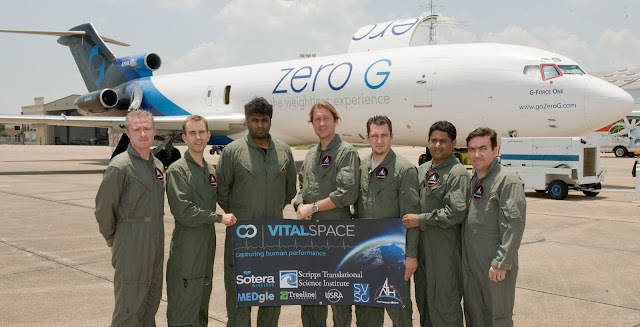 In mid-2011, A4H was approached by a new startup called Vital Space that was working with the Silicon Valley Space Center. They wanted to know if we could help them test an innovative biometric monitoring system in the microgravity environment. Together, we wrote and submitted a proposal to the NASA Flight Opportunities Program, which the space agency accepted in an October announcement. We were scheduled on the May 2012 parabolic flight campaign operated by NASA Reduced Gravity Office out of Ellington Field, Texas. With the commercial spaceflight revolution upon us, there will soon be regular private suborbital spaceflights. This will open up space to a new cohort of flyers who have never experienced the environment of space and the stresses of launch and reentry. This presents an important opportunity to study and monitor the medical effects this new group of flyers will encounter. After all, they will no longer be a narrowly chosen elite group of highly trained government space agency astronauts. One of the key goals of Vital Space is to take new advancements in mobile medical technology and apply them to the space setting to establish an easy-to-use vital sign monitoring system that space passengers can wear. In this case, we tested the FDA-approved ViSi MobileTM system from Sotera Wireless, Inc. More about the experiment is in our press release. Jason Reimuller and I were chosen as the A4H test subjects for the experiment. To get to Houston, we opted to fly in his Mooney 231 from San Francisco. Jason is an experienced commercial pilot, and I am a student pilot, so I really appreciated the opportunity to put my newly learned skills to practice on the long cross country flight. We flew VFR at 17,500 feet most of the way, which required the use of supplemental oxygen. You can see me wearing the oxygen cannula overlying the Sierra Mountains in the photo here. On the second day of our trek, we had to divert around a major storm system in southern Texas, requiring modifying our flight plan in route and choosing alternate airports. 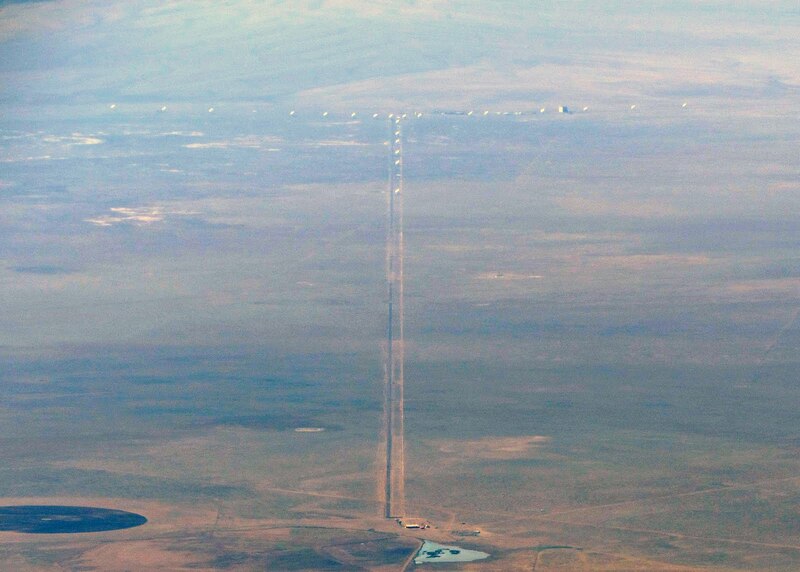 This meant we passed very close to the Very Large Array, so I snapped a picture of it. It was overall a very educational experience for me at this stage of my flight training. Once we arrived in Houston, we met up with the other five Vital Space team members, got our NASA badges, and went to orientation training at the Sonny Carter Training Facility, which houses the NASA Neutral Buoyancy Laboratory (NBL). There, we were briefed about altitude physiology, hypoxia symptoms, motion sickness avoidance, and emergency procedures for the parabolic flights, which operate at altitudes around 30,000 feet. It was basically the same thing I learned at NASTAR and AGSOL training last year, as well at the human factors course I took this past semester, but the review was nice to have nevertheless. We also had a brief tour of the NBL facility where the astronauts train for their EVA activities. Although we had spent several months preparing for the experiment, it all came together during the final few days before the flights when we refined and rehearsed our procedures for each parabola. The seven of us were to populate two teams of four people to carry out duplicate experiments over the course of two flights per team. Jason was a test subject in one team, and I was in the other. In case you're wondering how we divided seven people two ways, the Sotera engineer who was the expert on the Visi Mobile device we were testing had the privilege of flying on all four flights (proving it really is better to be a "Scotty"), while the rest of us flew on two flights. 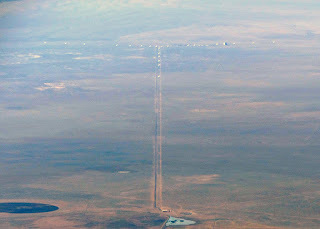 Each team performed a sequence of tasks spanning 80 parabolas over the course of two flights. That's about 33 minutes total of reduced gravity time (12 minutes of lunar and 21 minutes of zero gravity). Here's a shot of the whole Vital Space team together in front of our chariot, G Force One. Bad weather scrubbed the flight on the first day of the campaign, requiring us to reschedule it later in the week. With the free day, some of us used the time to go sightseeing. First, we took a walk down to see the NASA T-38 trainers. 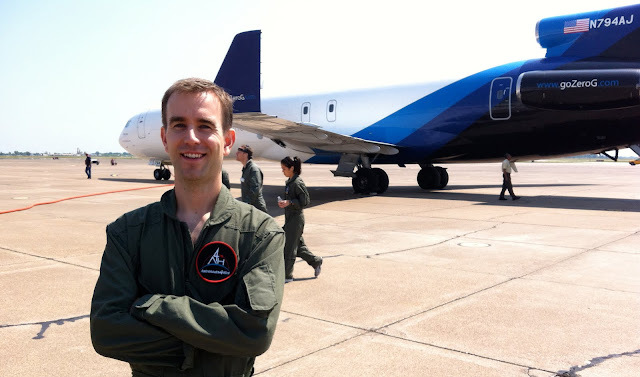 Astronauts use these supersonic jets to develop and maintain their pilot proficiency skills. Feeling very Top Gun-esque, I had to get a photo posing next to one. Later, Jason and I went to JSC and met up with my friend Ryan Zeigler who now curates the Lunar Sample Laboratory. He gave us a tour of the clean room facility where all of the Apollo lunar samples are kept. We looked at pieces ranging in size from dust grains to small boulders. Holding a piece of the moon in my hands was profoundly humbling. 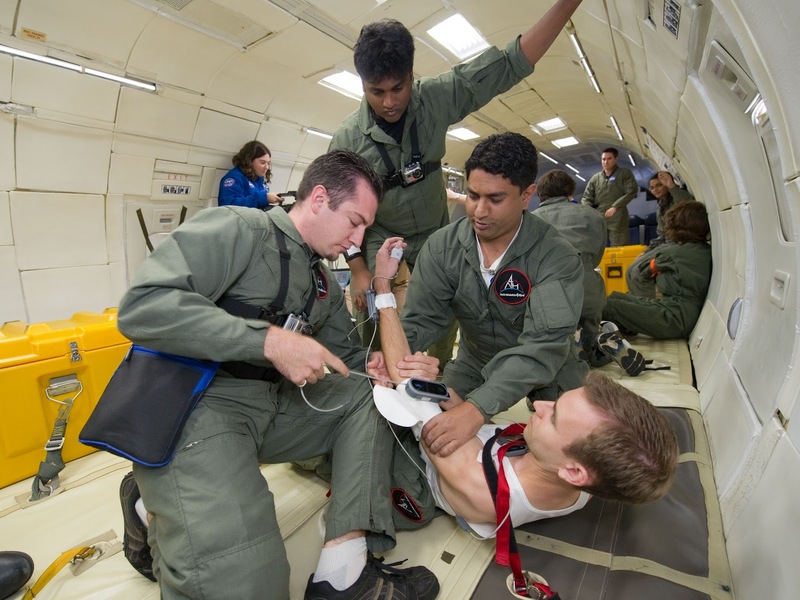 Each morning before our parabolic flight, we had mission briefings from the Reduced Gravity Office and medical briefings from a NASA flight surgeon. That's when they handed out the scopolamine anti-motion sickness drugs. You weren't required to take it, but almost everyone did, and I was no exception. Although I have no prior history of motion sickness in any environment (including the provocative rotating room and HULK at AGSOL training), I wasn't going to take any chances since this was no joy ride. I had a job to do and couldn't afford to risk getting sick. With no discomfort after the first flight, I halved my dose for the second flight and still felt great. Preparing for a flight meant donning the ViSi Mobile system. This involved sticking three EKG test leads on my torso to record my heart rhythm and routing the cable down my arm to the wrist unit, which has a touch screen control and color readout of realtime vital signs like blood pressure, pulse rate, and blood oxygen. A small PPG unit strapped to my thumb measured blood oxygen saturation. An optional blood pressure cuff can attach to the unit to provide a calibrated blood pressure reading. Before each flight, we took about five minutes of baseline data while I was at rest to serve as a control for the experiment. The first of my team's two flights covered basic functionality of the ViSi Mobile system. This involved testing the signal quality during various movements in lunar and zero gravity. In lunar gravity, I hopped around like a moonwalker and did one-handed pushups. In zero gravity, I translated across the cabin by pulling myself hand-over-hand and by just pushing off and floating. In every case, my other three teammates were there to coordinate, record, and control the experience. We passed a ball around (tethered to a string) during both gravity scenarios too. 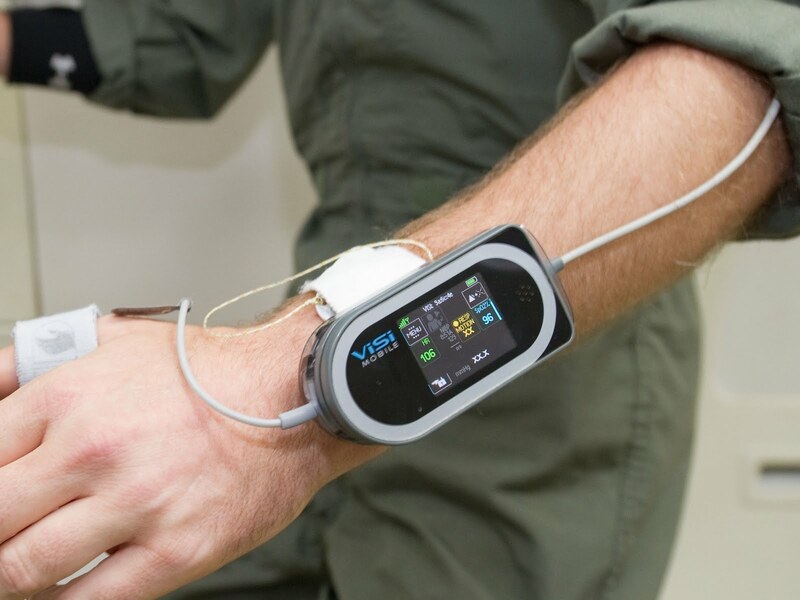 In every case, the purpose was to test range of motion and signal quality while wearing the ViSi Mobile system. 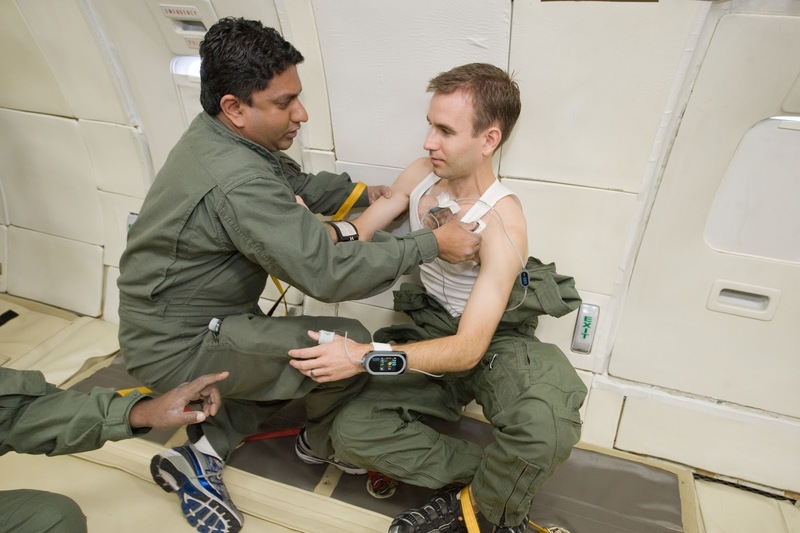 Another important set of tests we did under both gravity situations was to take off the upper part of my flight suit, attach the blood pressure cuff, perform a blood pressure calibration, stow the cuff, and put the flight suit back on. Floating in zero gravity is like nothing else on Earth. I suppose it is most similar to SCUBA diving without the resistance of the water surrounding you. Newton's third law is very apparent, as every small motion results in a response, and no amount of flailing around will change your motion until you contact another object. 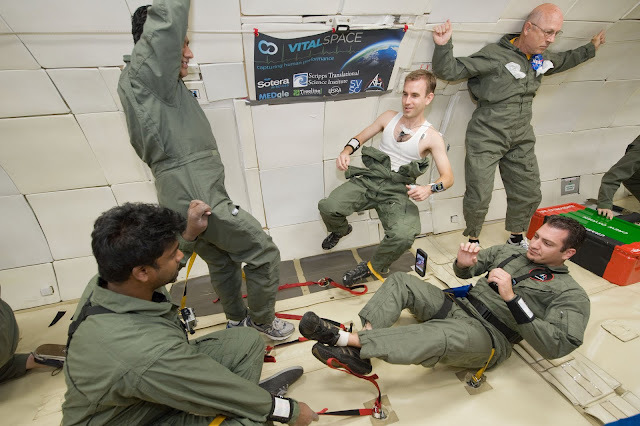 I found floating in microgravity to be an extremely relaxing and gratifying experience, and I'm sure it is just a taste of what life on orbit must be like. I shot the video below with my phone during the first flight as I floated around. The second flight focused on more advanced case studies using the ViSi Mobile as a diagnostic tool in an emergency situation. I played the victim, and my teammates took on the role of space paramedics. In both lunar and zero gravity, they approached me, secured me in place with straps, removed half of my flight suit, attached the entire ViSi Mobile system, calibrated the system, and stowed everything away when they were done. They also practiced transfer maneuvers to move me me from one location to another and rotational maneuvers to change my orientation in space. I performed some fine motor tasks manipulating the ViSi Mobile screen using a stylus, which is what one would have to do when wearing spacesuit gloves. Although we had a full menu of tasks for each flight, we managed to get ahead of schedule and free up some parabolas to just enjoy the experience. We made sure to spread these out with a few at the beginning to acclimate and a few at the end to move around more freely. The video here features me in a thrilling forward tumble assisted by a NASA flight director near the end of the last flight. Nominally, we were testing whether the ViSi Mobile would still function during such acceleration. Who says work can't be fun? This was A4H's second research job, the first one having been our space beer test flight, which garnered widespread international media attention before and after the flight. That project put us on the map, helping pave the way for this current opportunity. I am extremely happy with the Vital Space collaboration and feel honored to have participated in their first flight experiment. It was rewarding to take it through the entire process from idea to operation, and I look forward to future flight opportunities. Wow!! :o It's so great!! Zero gravity likes in movie and documentary! :o Thank you for sharing!